Catnip may be popular for its effects on its animal namesake, but it has also proven beneficial for humans for many years. 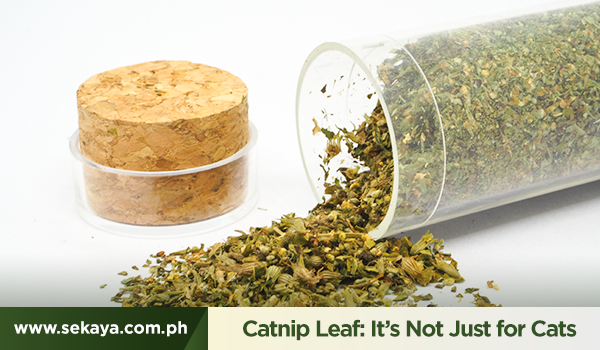 Catnip also affects humans, but the results depend on which part of the plant is used and how it’s ingested. Studies in the 1950s-60s claim that chewing on catnip root “will make the most quiet person fierce and quarrelsome.” 1 Catnip leaf, on the other hand, was being used as a key ingredient in sedative and calming concoctions as early as the 1600s. The leaves and stem of a catnip plant have sedative properties because they contain a compound called nepetalactone, which is similar to the compounds found in valerian – a plant more commonly used in treating insomnia and anxiety. To this day, catnip is still one of the herbs doctors often recommend for those suffering from insomnia and nervous exhaustion. 4 Other calming herbs used for this purpose include chamomile, passionflower, and American scullcap3 – all common ingredients in many calming herbal infusions and remedies. If you’d like to experience the relaxing effects of catnip leaf yourself, try the Sekaya Cozy Calm Botanic Infusion – an infusion that helps you unwind after a stressful day. This soothing infusion is made with a base of decaffeinated Indian green tea blended with chamomile flower, peppermint leaf, scullcap leaf, wood betony, catnip leaf, and stevia leaf.